For my last birthday (back in March), or possibly even Christmas last year, I was given a Sweet Shop Recipe Book (which I had asked for). It has recipes for a whole range of exciting sounding sweets, fudge, toffees and truffles – but of course I haven’t gotten around to making anything from it for the whole year. Upon spotting that one of the recipes was for champagne truffles (incorporating two of my favourite things – champagne and glitter), I decided this Christmas was time to change all that. And I’m please to say that the result, even if I say so myself, does look pretty stunning). Although we followed the recipe in terms of ingredients, we did change exactly how we carried out various stages, primarily due to previous truffle experiences. After tempering the chocolate we lined some ice cube cases with it, before adding the truffle mixture (which included both Cava and brandy- mmm…). We then covered the truffle mixture with more tempered chocolate before leaving the truffles to set. Once the truffles were set, we prised them out of the ice cube cases and added edible gold glitter. 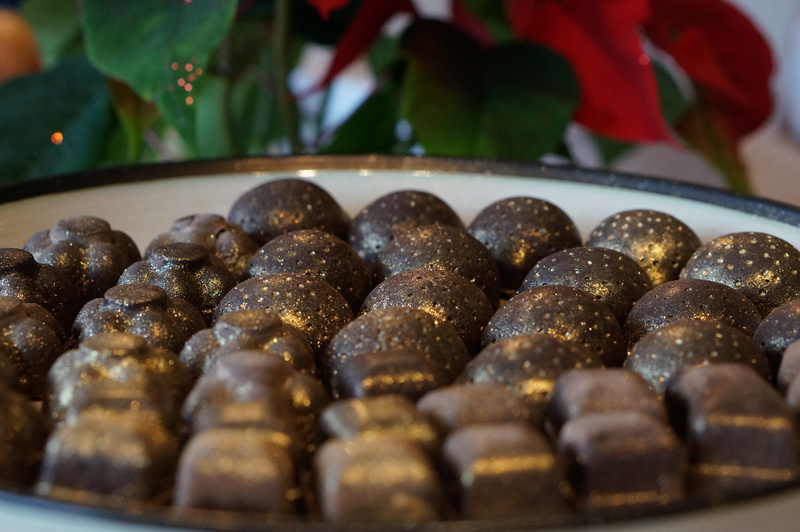 We weren’t sure of the best way to add the glitter at first – brushing them seemed to work, but then I tried adding some glitter to a small sieve and shaking that over the truffles (just as you would with icing sugar). That worked well, and to get a really good shimmer we then brushed that glitter over the truffles. The end result is really decadent, and definitely one that impresses. Guests didn’t know whether the truffles were homemade or shop bought, which made me feel good! Following on quite closely from my last blog post about cherry cupcakes, this week I made two more varieties – candy cane cupcakes and eggnog cupcakes (more about those later…). All of these recipes came from my Hummingbird Bakery cookbook, I have wanted to bake all of them for ages (the pictures make them looks pretty amazing), I was testing them all (partially) to see if they would be suitable Christmas presents, and they all follow the same basic recipe – although the frosting for each is rather different. Here, it’s the frosting that truly makes the cake. Both the candy cane cupcakes and the eggnog cupcakes really are a basic muffin mixture – they don’t even have the added cherries of the added cupcakes. 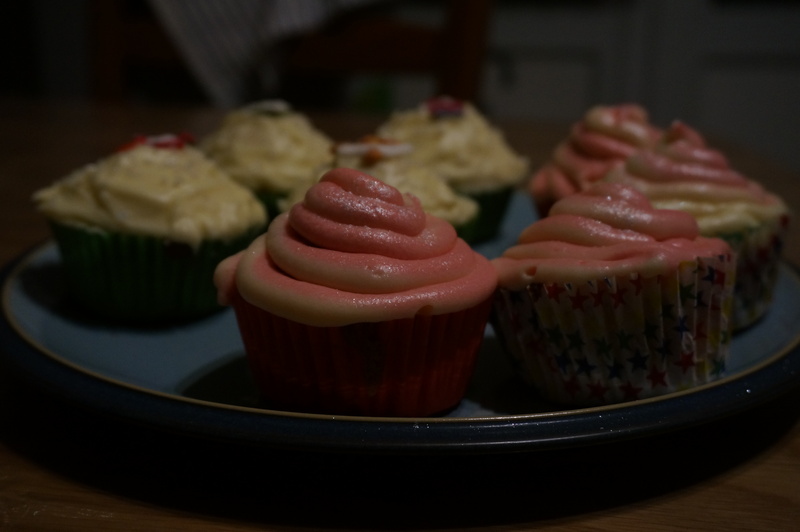 So for these two cakes, I made the actual fairy cakes together, and then made two varieties of frosting. The frosting for the candy cane cupcakes is a striped pink and white frosting, liberally flavoured with peppermint essence, which you pipe onto the cakes. You get the two-tone effect by placing the pink and white butter-cream side by side in a piping bag before piping it onto the cake. You then finish off the whole thing by adding some translucent sugar (or, in my case, some edible silver glitter – because that’s what I had). In the past I’ve used spray glitter, but recently I’ve bought some sprinkle-on glitter because spray glitter tends to send icing sugar flying. 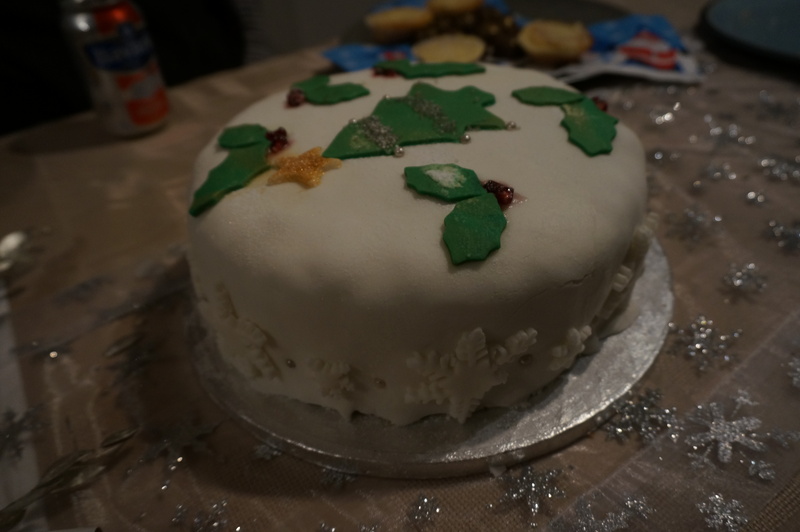 It worked well, although it may be that the spray glitter would have been fine to use as it was being added to butter-cream, rather than a much more fragile coating of icing sugar. The one thing to say about these cakes is that they are very minty. They taste like eating a tube of toothpaste. Which is great if you’re me and love the taste of mint, but less positive if you hate the stuff. Of course, there’s no reason why you couldn’t flavour the butter-cream with something you did like the taste of (lemon/ almond/ vanilla/ rum etc) – or just use less peppermint essence! Oh, I was also rather pleased with how these looked when I made them! 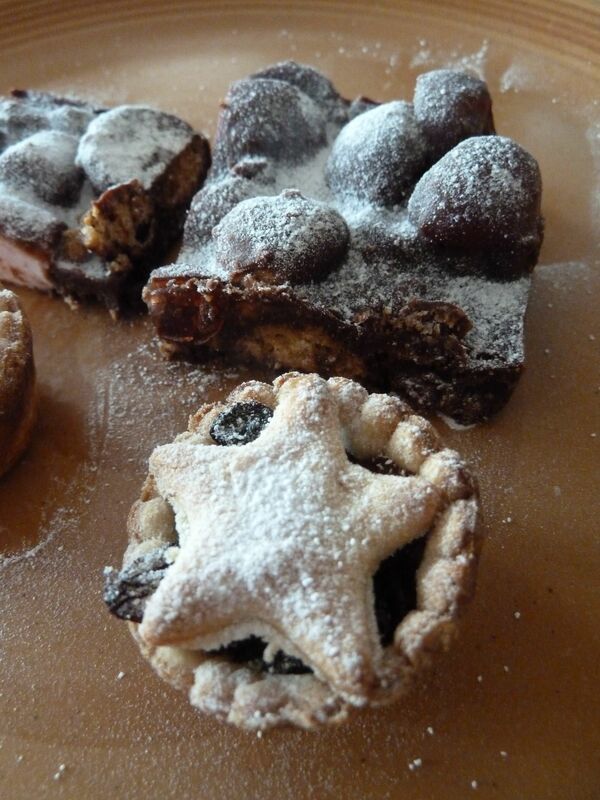 I made these before, a couple of Christmases ago when we hosted Christmas at our house. They turned out pretty well then, so I thought I’d give them another try. I was looking for something to make for our wedding anniversary, but we had eaten a lot of cake recently, so I wanted a more biscuit-based treat that we could enjoy steadily over a week or so. Small chunks of rocky road seemed to fit the bill. Frustratingly, these didn’t turn out as well this time around as they had done when I made them previously. For starters, I didn’t cut bash up the amaretti biscuits small enough, so there were large chunks (too large) in the final mixture. This also meant that there were large sections of rocky road that were just melted chocolate, as the other parts of the mixture weren’t small enough so that everything mixed in together. Fine if you like chocolate and then biscuit, but less good if you’re going for a mixture of the two. I also used cake tins that were far too big. I split the mixture in two because my vegetarian husband doesn’t eat marshmallows, and I love them. However, one of the two cake tins I used would have been enough for the entire mixture. As a result, the rocky road was far too thin. Finally, the glitter I have is in a spray can. I would probably advise anybody buying edible glitter to buy it in a pot, not a spray can, as I sprayed the glitter over the rocky road after sprinkling it with icing sugar. This mostly had the effect of causing all the icing sugar to disappear off the rocky road, and only leave glimpses of edible glitter. If I don’t buy a pot of glitter before I do these again, I’ll make sure I spray the rocky road before adding the icing sugar. Overall, these tasted fine and I would make them again – but that’s mostly because I know where I went wrong, and also know that I can make them far better than I did on this attempt!